There's a mouse in our house. Or Maurice loves Nutella! I wish that one of these was Maurice. Or maybe not - they're really huge! When I spotted a little head peeking around the corner of our dryer a couple of weeks ago, Stephane pooh poohed my exclamations that we have a mouse in the house. And he continued to ignore them until the brazen creature ran over his toes while he was doing a downward facing dog during his early morning yoga practice. This daring act was the declaration of war that convinced Stephane that we must eradicate the vermin. But how did the mouse get here? We live on the fifth floor. Did it take the elevator? We've entered a new level of mouse-n-man combat with the addition of Nutella tonight. For the first time we have a mouse in the Alexandria house. He's been here for weeks and turns out he's very intelligent and arrogant. Smart because he's ducked all manner of traps set heretofore. So many traps that it's near impossible for him to hang out in his usual fave place without at least inadvertently stepping on one. Arrogant because he shows up in our living area day or night and just gives us a look like this is my house and I'm not gonna be leavin'. It's gotten so bad I've taken to internet research on how to get this guy. Multiple people on line swear by Nutella as the ultimate. Seems others have less savvy mice who go for the Nutella, and as of tonight I'm hoping ours has the same weakness. Traps are set and I'm waiting to hear some snappy results. We'll see, he's a tough customer. Wish us luck! Doesn't it sound like the same mouse? So, here's what I'm thinking, Maurice must have overheard Jon talking about all of the culinary delights in France and stowed away in his bag. And now he's here - eating our Nutella and cheese. Jon, you need to come to Paris and take care of Maurice! 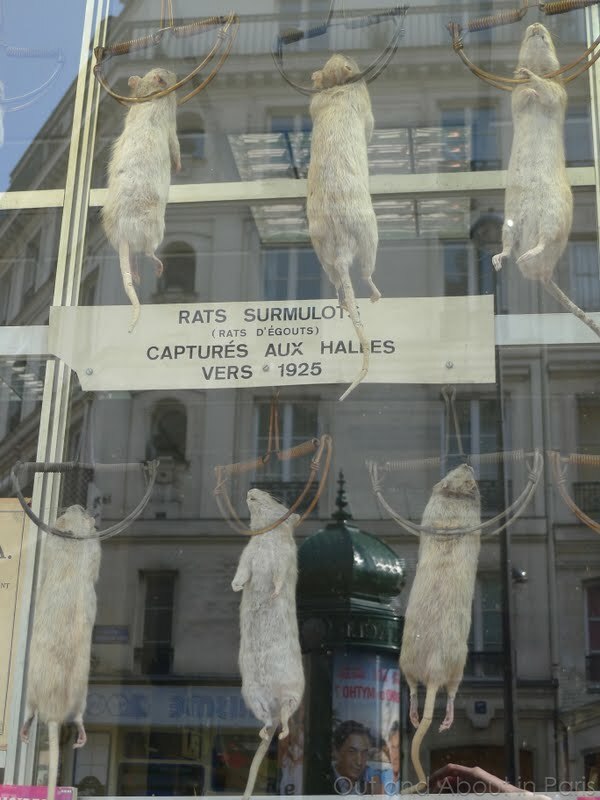 "Destruction of vermin" at Julian Aurouze, 8 rue des Halles, 75001 Paris. Rats captured at Les Halles circa 1925. I believe Maurice is long gone as we have caught 7 mice so far in our home. I am embarrassed to tell you that we had that many living in our home. I still think we have more in the home and are trying poison to get rid of them now. Like you, I still scream when I see one. I hope Stephane is a better trapper/hunter than us. Our problem has been going on for a long time. I first noticed the little guy when Jon and Sam were on their cruise. BTW, are you speaking French or English to Maurice? maybe that's been our problem, Jon and I don't speak French. That could explain why they didn't listen to our request for him and his family to leave our home. I like the idea of Maurice hitching a ride to Paris. What you need is a little dog to take care of your vermin problem. I was at the Champ de Mars last week and a little terrier came out of the bushes proudly carrying his latest catch - a 7in rat. Yuck! @theaccidentalparisienne, A dog sounds like a great idea. After seeing that Maurice has ignored all of the welcome traps that we set for him and decided to gnaw a hole in the garbage bag last night, I may ask if I can borrow someone's terrier. I just hope that Maurice doesn't turn out to be a 7 inch monster. Ann, Maurice is definitely a clever mouse who knows how to blend in with his environment! An Elvis impersonator in Memphis - that created a wonderfully funny image in my mind, especially since I used to live in Memphis. Any chance that you saw my post on the barbecue restaurant in Paris? I mentioned Corky's BBQ. And isn't August the month when a lot of tourists visit Graceland for the anniversary of Elvis Presley's death? Thanks for the tip about the sticky tapes. I'll mention it to Stephane since he's supposed to deal with Maurice. I missed this story earlier this year. Glad to see it now. And how I never noticed this shop on the rue des Halles, I do not know.